There is no easier way to turn a plain piece of meat into an extraordinary meal than with LYSANDER'S Mesquite Rub. Simply rub on and cook. 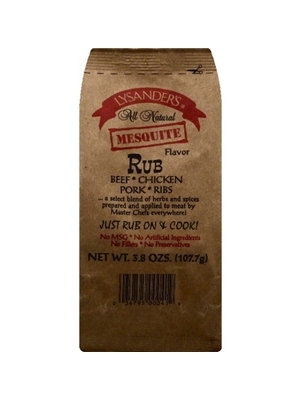 LYSANDER'S Mesquite Rub is made with a proprietary blend of all-natural herbs and spices developed to complement the natural meat flavors, not overpower them. Salt, sugar, granulated onion, celery salt, paprika, granulated garlic, maltodextrin, mustard flour, mesquite powder and other spices.